I caught a Damon Wayans stand up special on TV the other day from sometime in 80s, in which he stated that this was his last stand up gig, as he realized that he was performing more for the money than for the creativity or love of doing it. Wayans then went on to say that he would rather stop than “sell-out”. The next day I was flicking channels when I saw him again on My Wife & Kids, and I thought that either he forgot what he said in his special, or that he thought that My Wife and Kids was creative stuff and worthwhile indeed. Now might be a good time to inform you that he spends a great deal of time each episode trading painfully unfunny zingers with a 5 year old hip-hop talking boy, all in the name of meaningful comedy. Now I am not here to begrudge Mr Wayans his career, you need to make some bucks to pay the bills, but given that imdb shows such “classics” as Blankman, Celtic Pride and Bulletproof in the 90s alone, (and nothing memorable since I might add), I can’t help but feel like he must be disappointed in either his earlier comments or his career. 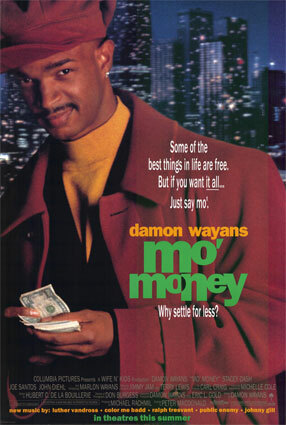 Mo’ Money is lightweight and disposable, but if nothing else it does show that Damon Wayans was, at one point in his career at least, funny. Were it not for The Last Boy Scout this would be far and away his most watchable film. Strangely enough the filmmakers decided to build a comedy around a plot which at its core is a crime film. Naughty white guys have started a scam involving pre-approved credit cards issued to deceased customers (dead men tell no tales), and running up expensive tabs buying items to be resold at lower prices. Damon and his little brother Marlon (who is now in every second crappy comedy made) are John and Seymour, two small time scammers whose lives revolve around the pursuit of cash, as long as it doesn’t involve real work. When John comes across a young woman for whom he harbours amorous intent, his pursuit takes him to the offices of a large corporation, where he decides the best way to further his courting process is to take a menial job as a mailroom assistant in the same building. To complete the tenuous plot connections the brothers are somewhat “mentored” by Walsh, the ex-partner of their deceased policeman father who coincidentally happens to be investigating the credit card scam, which happens to be going on in the new firm John just got the job with. Long story short, John gets involved over his head in the credit card scam and must find a way to extricate himself without further drama or police intervention, whilst at the same time allowing him to pick up (and later keep hold of) his love interest named Amber, who it must be said is a terrible actress who is given some painfully forced dialogue. But Mo’ Money has precious little to do with the plot, it is a chance for the two Wayans to try on different personas in a series of scenes which are basically skits that serve only to cause amusement and do the bare minimum to justify the next scene, where they can do the same thing only different. Being an early 90s film and being that Wayans is a hip black guy he gets to wear a whole range of increasingly stupid looking hats (all of which are supposed to be cool by the way), and a garish collection of “urban executive” wear, which I guess were all fashionable at the time. The humour is largely based upon the larger than life characters in the film, many of them created by John as he runs his various scams early on, but some of them in the various bit parts that populate the rest of the cast. There are numerous throwaway lines and scenes-within a scene that try to scatter jokes throughout with about a 50/50 success rate, and keeping with that ratio thankfully the bonehead lines (and there are a few) are equally offset by some really good moments. Given that the PC craze was only just gaining steam in the early 90s there are a few thinly veiled race-related jokes that fall flat in today’s environment, not so much because they are racially based but because they just aren’t that funny to begin with. Now I considered it odd that a light comedy would even bother with the intrusion of a criminal sub-plot, especially one that justifies the murders that happen in the film, but if you are to have a bad guy, at least make him menacing, this is where Mo’ Money definitely succeeds. The bad guy Harry Lennix, the head of security in the credit card firm, keeps things low key and doesn’t resort to overacting his way through his scenes like the remainder of the cast. You are always guessing at what he might do next, especially as you know he is capable of acts of violence from early in the film, and you are just waiting for him to snap and do something. When he finally does it isn’t his fault that the finale seems totally out of place in an 80’s flashback over the top sort of way, but the film had to end somehow, and turning Wayan’s character into an instant quasi Bruce Willis must have seemed like a good idea at the time. Despite the dated elements of Mo’ Money, and the fact that the crime elements seemed forced into what should have been a fluffy personality driven comedy I still liked Mo’ Money. Final Rating – 7 / 10. Inoffensive, amusing at times and thankfully pretty brief. Mo’ Money also harks back to a time when a Wayans could actually cause me to crack a smile, (Scary Movie, White Chicks etc killed that…).